Suppose the date of the latest price you selected is 04/07/2018, and the price of Iron ore on that date is 480; the index of Iron ore on 04/07/2018 is 57.07, and that on 26/07/2018 is 58.84, with an index change of 3.10%; then, based on SunSirs index pricing principle, the up-to-date Iron ore price for reference is 494.89. Commodity index is derived from commodity price, and reflects the change of commodity price in the mean time. 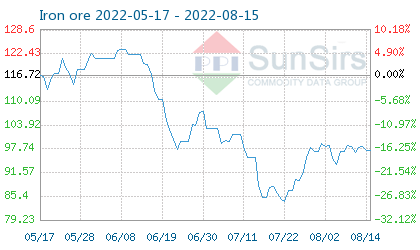 After several years’ development, SunSirs.com has collected commodity indexes of more than 300 commodities from 8 industries. These indexes are widely used by industry users, futures organizations and securities organizations as a tool to reflect the change of prices. 4. P0 stands for the commodity price on the selected date. Since the commodity index in the above formula has removed all attributes of the commodity prices such as location, type and price unit, pricing based on the formula is always fair, fast and simple when used by manufacturers, distributors and downstream users.